Getting older is no fun sometimes. I am starting to get super conscious about things like wrinkles especially when I start to see fine lines forming at certain areas of my face such as the forehead and corner of my eyes. Really need to put a halt to my habit of making a weird expression and scrunching my forehead when I am thinking LOL. Also, this makes me wonder how early is too early to start incorporating any anti-aging product into my skincare? As far as I know, there is no exact rule to this and it's never bad to start as early as we can right? 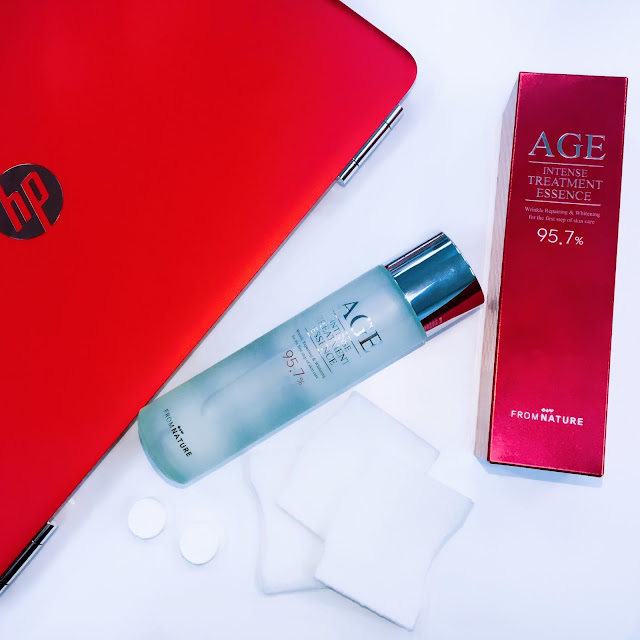 Right around the time when I was being more conscious about anti-aging, the brand FromNature reached out and offered me a chance to review their products including the FromNature Age Intensive Essence 95.7%. Being a skincare lover, of course, I said yes. Plus, it's about time that I start to experiment with more 'age prevention' product. 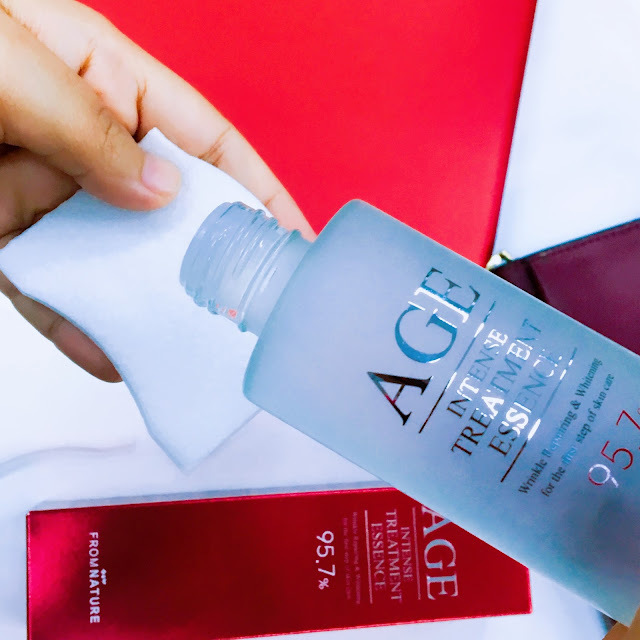 If you are familiar with the Missha First Treatment Essence, you'll definitely be comparing the packaging of the FromNature Age Intensive Essence 95.7%. Would I call it a more affordable dupe? I can't say because I've never tried the Missha version, but I would say that this is a great option to consider since it's relatively cheaper. Comes in a frosted glass bottle, I love the expensive and classy feel of the packaging. Comparing the ingredient list, I can see some of the star ingredients such as Galactomyces Ferment Filtrate and Niacinamide are present in both product. If you are unfamiliar with Galactomyces Ferment Filtrate (GFF), it is actually one of the star ingredient used in anti-aging skincare. A by-product commonly found in products made with rice such as soy sauce, rice vinegar and miso, this miracle ingredient is said to help in smoothing the skin, improve blood circulation as well as restore skin vitality. 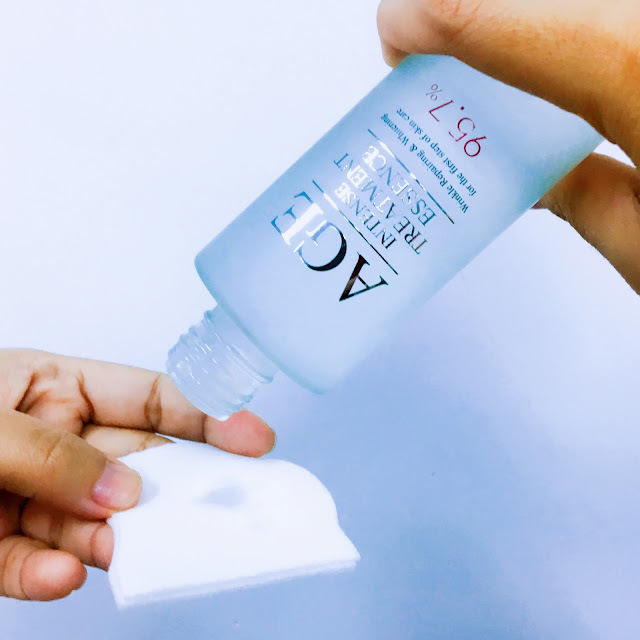 If you are familiar with SKII Pitera, this is probably one of the most affordable dupes you can find out here and it contains 95.7% of GFF. This one bottle of treatment essence feels like it's going to last forever. I barely make any dent to it. Well, most likely because I tend to accidentally skip it in some of my routines but so far I am still positive about this product. I have not experienced any bad reaction or breakout from this. I do feel like this essence is slightly stickier than I'd like it to be but it does give the hydration my skin needed. I am unable to comment on it's anti-aging ability yet but I am going to continue using it until the last drop especially around my forehead area. My 'thinking' lines are getting more prominent lately, it stresses me out. So yeah, I would say that for this round, it's more of a first impression/first stage review of this product. I will update this blog post + update on my Facebook page and Instagram story once I finished the whole bottle, so stay tuned! To purchase the FromNature Age Intensive Essence 95.7% or view other products available, you can visit FromNature Official Malaysia Store on 11 Street or EZbuy for Singapore buyers. For more information about the brand, check out FromNature Facebook page on facebook.com/fromnaturemy.